On Thursday, Tennessee received some good news pertaining to their defensive depth for next season. Rising senior outside linebacker Darrell Taylor announced his decision to stay for his senior year via Twitter. Taylor will be a redshirt senior in 2019. He was a part of the 2015 signing class where he was ranked as a composite four-star prospect. He has shown plenty of flashes throughout his career, recording a career-high 12 tackles two years ago against Georgia Tech. In his first season under Jeremy Pruitt, he began to put it all together, though he still showed inconsistencies. Taylor started nine games and appeared in all twelve games in the Vols’ 2018 season. He totaled eight sacks on the season, seven of which came in games against Georgia and Kentucky. His eight sacks in SEC play ranked second behind Kentucky’s Josh Allen (10). Taylor had three games with three or more TFLs and two games with three or more sacks, which was tied for the most in the nation. For his performance against Kentucky, he was awarded SEC Defensive player of the week, Walter Camp National defensive player of the week, and Bednarik National player of the week. 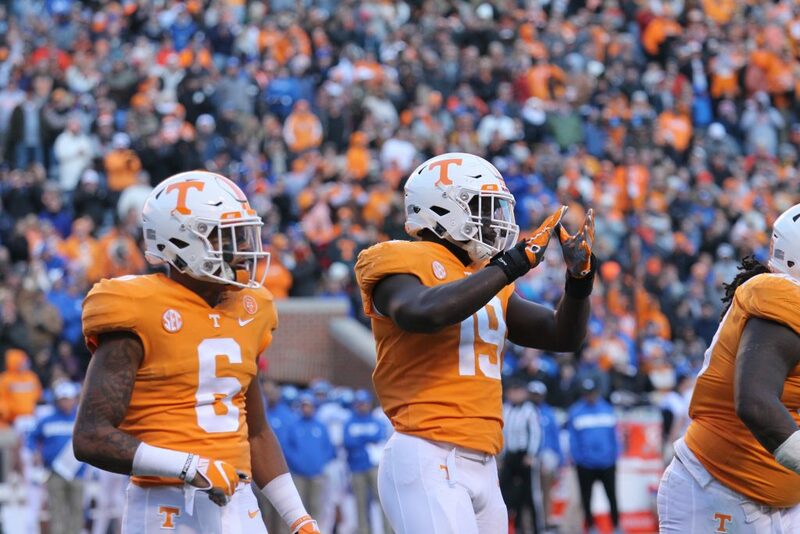 He was awarded Tennessee’s defensive MVP at the team’s postseason banquet this year. Taylor will likely be a starter for the Vols in 2019, and he’ll be somebody that they will rely upon heavily as a pass rusher. If he can continue to build upon his 2018 season, he could end up greatly improving his draft stock. He already has NFL size and athleticism at 6-foot-4, 247 pounds. As a redshirt junior, Taylor totaled 36 tackles, eight sacks, 11 tackles for loss, three forced fumbles, and two fumble recoveries. In 30 career games, Taylor has recorded 72 tackles, 11 sacks, 16.5 tackles for loss, three passes defended, five forced fumbles, and three fumble recoveries.